The team from the John Innes Centre who study snapdragons (Antirrhinum majus) uncovered a new evolutionary "trick" that favours colour schemes which signposts a flower's entry point most clearly to pollinating bees. A paper published today reveals that the recently-evolved genetic mechanism, known as a hairpin, has been identified in nature for the first time. Professor Enrico Coen from the John Innes Centre says, it took the team "completely by surprise". "We have been studying these antirrhinum populations for 17 years and we were amazed by this," he said. "This is a new kind of evolutionary mechanism that had been guessed at, but nobody had actually shown that it was happening in the wild." "If you've ever wondered why animals and plants are different – then this discovery develops our understanding of how nature maintains variation by making species look different from each other." 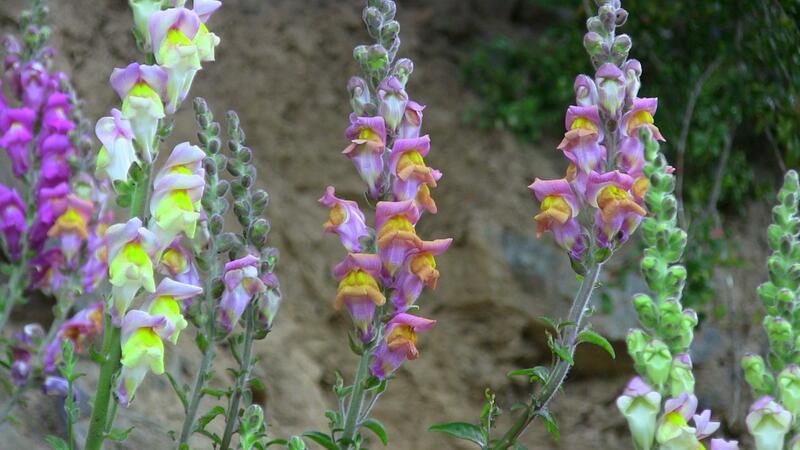 The discovery came from a curious spot in the Pyrenees where two populations of snapdragon species converge: one magenta with yellow highlights (Antirrhinum pseudomajus), one yellow with magenta highlights (Antirrhinum striatum). Between these two types is a hybrid zone where flowers displayed intermingled traits from the neighbouring populations. Through analysis of their genes, Professor Coen's group concluded that flowers in this area produced fewer seeds and offspring compared with neighbours on either side. The distinct colour differences between the populations indicated that something was stopping the genes that influence colour from spreading among the populations. The team focussed their study on a gene called SULF which focuses the yellow pigment in snapdragons. In the magenta snapdragons, the gene creates the small yellow highlight that clearly marks the entry point for bees. All flowers signpost their entry points to pollinators. The most effective, employ colour combinations that allow them to stand out. Pollinators prefer flowers with clearly signed entry points, conferring an evolutionary advantage to those with good signposting. New genetic techniques used by Dr Desmond Bradley at the John Innes Centre revealed the surprise structure in the genome where two copies of the gene had "flipped" to create the hairpin. Further investigations showed the team that the hairpin generates small RNAs (the chemical cousin of DNA) which restrict the magenta flowers production of yellow pigment. Professor Tamas Dalmay from the University of East Anglia whose research contributed to the study said "We knew that small RNAs regulated gene expression because there are hundreds of so called micro RNAs in plants. These micro RNAs produce a single small RNA and they play an important role in plant development. However, this is the first time we caught a hairpin becoming a micro RNA where the small RNAs drive the evolution of a trait in nature." Examination of the population genetics showed that the hairpin was present in the magenta flowers, found in some degree in the hybrid zone and was absent in the yellow populations. The team believe that the existence and distribution of the novel mechanism is evidence of a recently evolved natural phenomenon. By controlling certain characteristics, it maintains the variety of two populations that have independently come up with a solution for reproductive success. "It's like a border control, keeping the boundary there," explains Professor Coen: "The genes of colour in this case yellow are not allowed to pass from one population to another. "The historic difference between the sections either side of the valley is being maintained by natural selection in the hybrid zone." Snapdragons earned their common name because of the flowers' resemblance to the face of a dragon, that opens and closes its mouth when squeezed. These findings will interest the many gardeners who cultivate snapdragons to provide a splash of colour in herbaceous borders. Overall, they add up to a profound insight into the nature of evolution and change in plant, animal and human populations. This work is the result of a collaboration across the Norwich Research Park, between the John Innes Centre and the University of East Anglia, and researchers from Austria and China.